Feelings for this type of system run hot and cold! Love them or hate them, ground source heat pumps can offer excellent energy efficiency for your new home or renovation project. For many, many more cocktail ideas, browse Fine Cooking's cocktail recipes section. 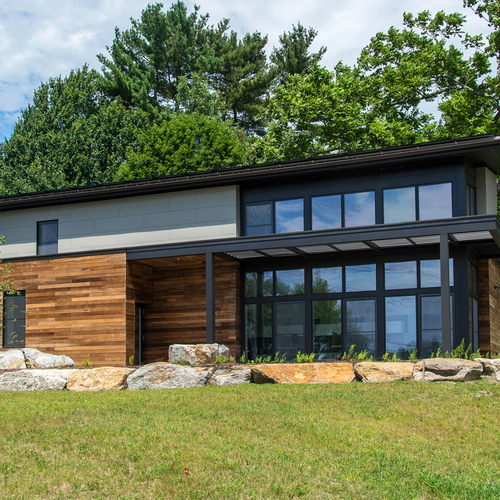 If you’ve done any amount of research on ground source heat pumps, chances are that you’ve heard from people who say that you’d be insane to consider them as a viable system for your house—AND you’ve heard from others who say you’d be insane NOT to use them. Where insanity and green architecture meet, you shall find Phil and me mixing a Dark and Stormy and turning on the mike to act as your good-natured guides. For this episode, we will attempt to demystify this polarizing heating and cooling system. Be sure to tune in later for Parts Two and Three, when we’ll talk about the advantages of each of the types of ground source heat pump and why the costs for these systems can vary tremendously depending on various circumstances. 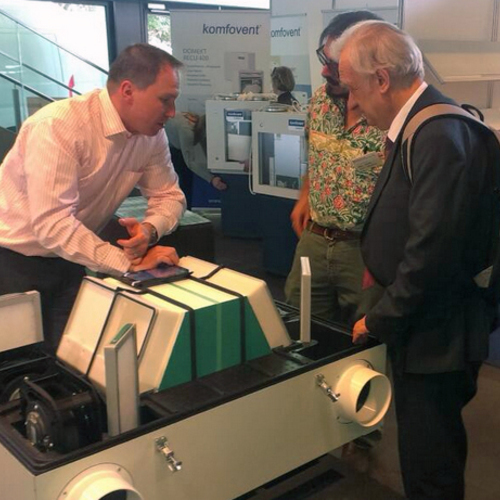 We’ll also share some rules of thumb for designing a ground source heat pump system. 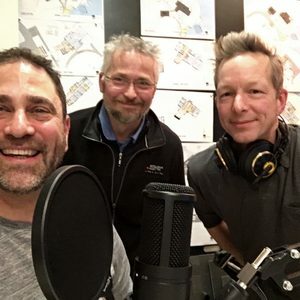 Phil will share a track from Here We Go Magic called “Collector,” and then we’ll play “Five Questions” with two professional ground source heat pump installers, Jeff Gagnon and Jim Godbout. Podcast: Ground-Source Heat Pumps, Part 2: Rules of Thumb Podcast: Ground-Source Heat Pumps, Part 3: Five QuestionsAre Affordable Ground-Source Heat Pumps On the Horizon?Ground-Source Heat Pumps (2010)Ground-Source Heat Pumps (2009)GBA Encyclopedia: Heat Pumps: The BasicsGBA Encyclopedia: Green Heating OptionsGround-Source Heat Pumps Don’t Save EnergyGround-Source Heat Pumps Have Low Operating CostsHeating a Tight, Well-Insulated HouseEquipment Versus EnvelopeIs a Ground-Source Heat Pump a Renewable Energy System?Air-Source or Ground-Source Heat Pump? Hello, everybody and welcome to the Green Architects Lounge. I’m your host, Chris Briley. And I’m Phil Kaplan. 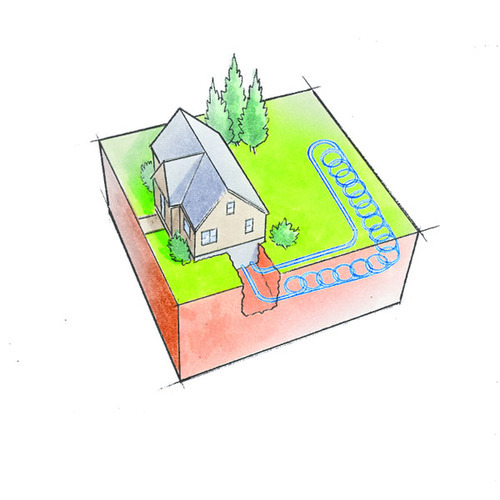 Today, we’re talking about ground-source heat pumps. Chris: That’s right. Ground-source heat pumps: What are they good for? This is a very controversial subject, don’t you think? Phil: Somewhat controversial. I think people get excited about it, and they don’t have all the facts. Like just about everything we talk about, there are so many different technologies, but under the right circumstances, only one is the right one for you. Chris: And I’m back to choosing the cocktail. 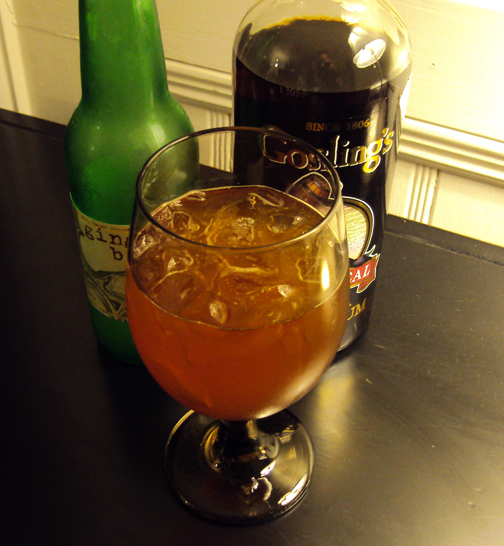 This is one of my favorites for the summertime: the Dark and Stormy. It’s basically one part rum and two parts ginger brew. Not ginger ale; you don’t want to put Canada Dry in this. You want a Jamaican-style ginger beer; I’m using Maine Root. And I’m using Gosling’s Black Seal rum. OK, now, are you ready to delve into geothermal? Phil: Yeah. But we understand why; it’s a common mistake. When people say “geothermal,” it means that you’re going deep, deep, deep into the magma. Chris: Yeah, but what we really mean is “ground-source heat pump.” It’s heat pump technology coupled with the heat of the earth to make that heat pump more efficient. In a heat pump, we’re not creating heat; we’re moving heat, OK? So the heat pump cycle is you have refrigerant in a loop, and on one side you’re pressurizing it—it’s hot. Then it goes through an expansion valve and expands into a gas—and it gets cold again. Take your refrigerator: a classic heat pump. The expansion happens inside the box and it gets compressed outside, so the heat is pumped out of the box. You’re actually heating your house with your refrigerator, but you’re making it cool inside the refrigerator. OK, your normal heat pump—before we bring in the “ground”—is basically treating your house like the inside or outside of your refrigerator, whichever way the heat pump is running. You’re either shoving heat into the house or pumping heat out of the house, just by whatever your distribution method is. So, the thing about the heat pump is, that hot is really hot and that cold is really cold. What if you could always have the temperature consistent in the compression mode? It’s always 50 degrees, let’s say. Phil: Like it came from the ground, for instance. Chris: And you’re making the heat pump more efficient. A ground-source heat pump is using the inertia of the temperature in the earth to make the heat pump more efficient. That, in essence, is how a heat pump works. 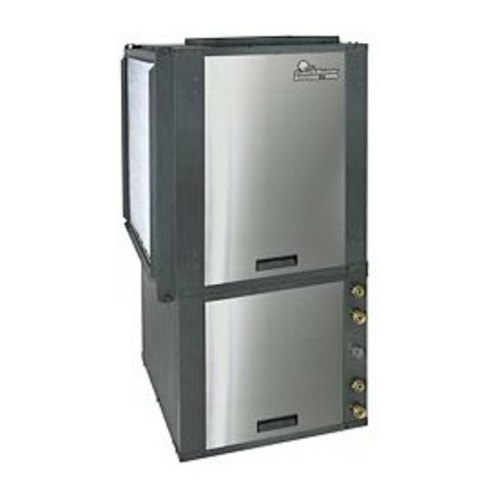 One of the great things about a heat pump is it can do either heating or cooling. Phil: There’s a term that the geeks kick around: COP, coefficient of performance. Essentially, it’s one unit of energy in and one unit of energy out. What if you could change that equation? I’m putting one unit of energy in, but I’m getting two out or I’m getting three out. Chris: Maybe this is a system that can really do something. Phil: Air-to-air heat pump, many people say three. I haven’t seen it; I’ve seen two or high twos. Chris: The literature says three. Phil: Maybe under ideal conditions. 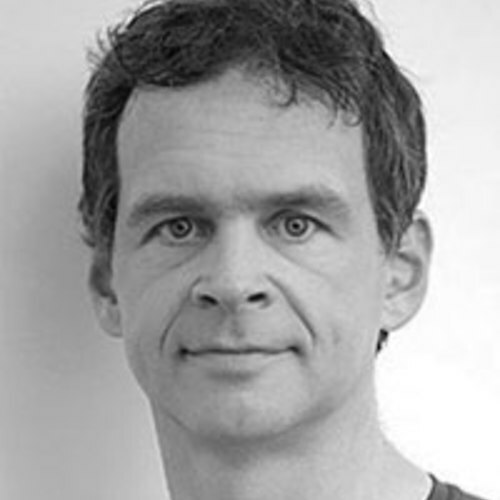 Chris: Ground source heat pump—what are we looking at? Phil: Four to five. That’s one of the bigger advantages of a ground source heat pump; the COP is higher. Chris: The COP is higher, and you’re going to be a lot more efficient with your electrical use. Phil: Another factor is where you are in the country. Here we are in Maine, and we’re heating most of the time. The ground temperature is in the high-40s, low-50s, depending on how deep you go. Chris: The frost depth is 4 feet. Phil: So, it’s a little harder to extract the heat from cold temperatures—but you can do it. If you go down to Virginia where the ground temperature is like 62 degrees, and you need both cooling and heating, it’s an ideal system. Chris: Another bit of alphabet soup that you’ll see on labels is the EER, which is the energy-efficiency rating. If you’re doing an Energy Star house, they’d be looking for an EER of 16.2 if you’re doing an open loop system, a 14.1 for a closed loop, and a 15 for a direct exchange. The higher the EER is, the better. It’s the output of the energy versus the amount of energy consumed. Divide the btu per hour by the watts per hour, and that’s the EER. So, there are three types, Phil: open loop, closed loop and direct exchange. Let’s start with open loop. You have a heat pump and on the outside is a heat exchanger of some kind. It’s going to have an earth coupling to get some heat from the earth. Usually we’re using water; an open loop system up here needs to use a well, a pond or a lake. That makes people nervous. Phil: It makes me nervous! Phil: Into the ecosystem somewhere. Chris: If you’re cooling your house, you’re warming up the water in your well. If you’re heating your house, you’re cooling off the water in your well with an open loop system. You’re just sipping it off the top. The pump doesn’t have to work nearly as hard, which is why an open loop system is almost always cheaper from an installation standpoint. However, you’re using your well that you drink from, you’re running the water through the mechanical system and putting it back into the well. Which is just fine; it’s just a heat exchanger, like the plumbing you use in your house. Phil: It’s not as icky as you’re picturing it in your head right now. Chris: Less risk, much more stability, and easier to model. The direct exchange is a bit spookier. I don’t understand it that well. 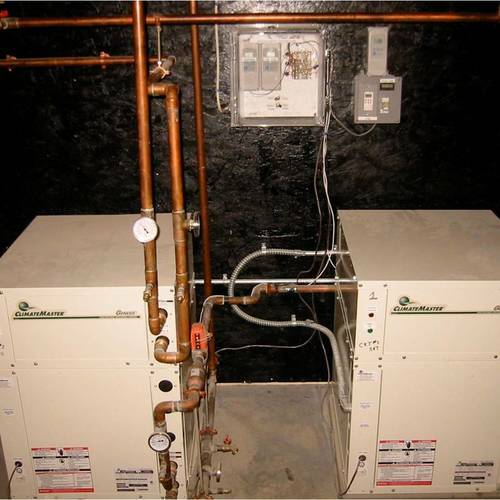 Instead of having a heat exchanger, you have the refrigerant you’re using in that heat pump. You’re sending that refrigerant into the earth to get cooled down or warmed up, and then back into the loop. So, basically you’re cutting out that 15% to 30% inefficiency you’d typically have with a heat exchanger of some kind. It’s like a closed loop system, only it’s the exact same refrigerant; it’s usually not in PEX tubing, but in copper tubing—it is part of the machinery. That makes some environmentalists nervous because you’re using not just a propylene glycol but an actual refrigerant that you’re putting in your well or in the earth. Phil: I smell a little BP potential! Voiceover: So that’s it for this part of the episode. 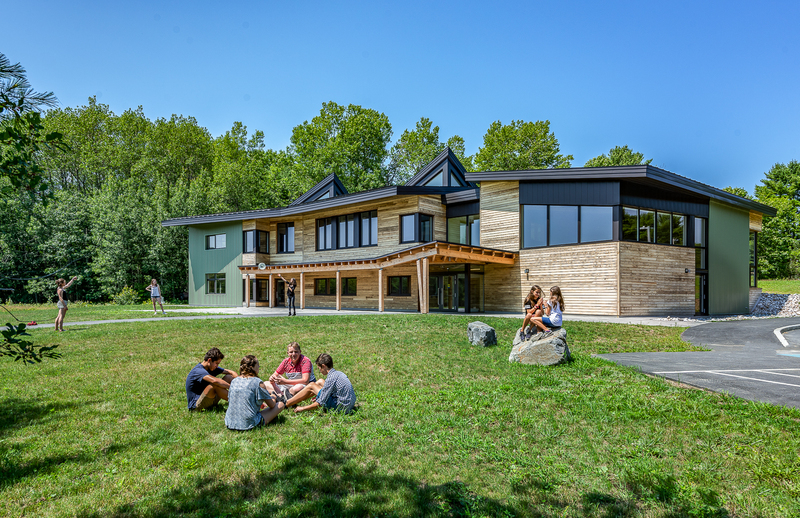 Tune in for more from the Green Architects’ Lounge podcast. A quick reminder, our music is “Zelda’s Theme” by Perez Prado. And our views and our drinking habits do not necessarily reflect those of Green Building Advisor. Thanks for tuning in everyone, and keep up the good work. Take care not to oversize! So glad I stumbled upon this. Love the entertaining way you present a technical yet important topic for homeowners to understand. You're probably going to cover this later -- at least I hope you do -- but as with any HVAC system, oversizing is a real problem that homeowners face without even realizing it. It's one thing if you've invested the normal amount of money in your system; it's quite another if you bought the farm and went for a ground source heatpump like I did. Homeowners must be vigilant about protecting their investment in energy efficient technology!!!! Thanks Trish. It's very nice to hear positive feedback. Great advice. I can't remember off hand if we cover this important concept on this podcast. In the next part of the episode we do cover rules of thumb for sizing these systems as a means of helping the designer early on. But it's always a challenge to have systems sized appropriately and not oversized since HVAC contractors always want to make sure they don't get the call from the owner that the house just can't get warm enough. Having a reasonably accurate model helps. Having a Mechanical engineer or subcontractor who understands your desire to "minimize usage" also helps. Having a client who says the words "minimize usage" right to your mechanical contractors face is amazingly transformative. You want to minimize? your usage? Good stuff. Thanks Trish. Thanks for sharing. I'm not one of the guys who filters such things on here, but i do know that we always have to walk the line of sharing open information and making sure people aren't hijacking the site to promote their own products, or businesses beyond representing them while they contribute your advice. as you are third party in the matter, I'll bet you'll be okay. Cheers. I noticed this podcast on the LSE website today. I might prove interesting to you guys to listened to what is happening over here. Save target as, link above. I notice that Modern Steel Construction had an article on thermal bridging avoidance. I am throwing a couple of curved balls here, in order to provide you guys with some out of left field inspiration. Chris finds direct exchange DX spooky. Here's a bit more on what should and should not make you nervous about that. 1) There's more refrigerant, and the refrigerant is a potent greenhouse gas. My system (not DX) leaked refrigerant, and I calculated that that leak undid more than half of the CO2 emissions benefit that the system had accrued over the 7 years I'd had it at that point. If a DX system leaks, the global warming impact is even worse. 2) There are more places for it to leak, and leaks underground are harder to find and to fix. What should not worry you is potential contamination of the ground with refrigerant. If it leaks, it all evaporates and goes into the atmosphere. So it doesn't contaminate your local soil or groundwater. It quickly vacates the premises so it can damage the whole planet, not just your yard. What might tempt you to consider anyway is that it achieves higher COP. Of course, five years after the original podcast, most people have dropped the idea of GSHPs in favor of mini-splits, so this comment is not likely to be useful to many people now, but after utilities start charging residential customers for peak loads, GSHPs will make more sense again, especially once they are based on CO2 refrigerants---if you are reading this in 2020, greetings from the past and I hope the world is at peace and powered by renewable energy!